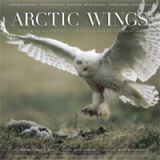 The ecosystems of the world are linked by birds, and nowhere is that more apparent than the Arctic National Wildlife Refuge, where more than 190 species converge from six continents to nest and rear their young. A lavishly illustrated book in full colour throughout revealing the vital importance of the Refuge to world populations and the consequences of allowing oil exploration within its boundaries - in 200 colour images award-winning nature photographers capture the drama of birth and renewal. The book also contains a 60 minute CD of the calls and songs of the birds featured in the book.